They had an FMEA PIG plot that showed that failure was of low probability albeit of high consequence. PIGS don’t fly, and did not in this case and they said OK live with the risk. And the risk came to reality. This latest action in the still unfolding story of what lead up to the largest tailings dam catastrophe in recorded history, reported by Paul Kiernan in the Wall Street Journal is apparently what Jack Caldwell is pointing to in his almost hidden post above. In Mr.Caldwells post, the “peer reviewers” included the renowned Dr A. MacGregor Robertson, a career long champion of responsible self regulation promoted through his entity Info Mine . Dr. Robertson was long term adviser to the project but has not been close to the project since 2011. (Apparently Samarco had an Internal Tailings Reiew Board f independent experts) “Consultants” refers to Dr. Joaquim Pimenta De Avila, engineer retained in 2007 near completion of the Fundao and a member of the “faculty” at Info Mine. Dr. De Avila who was replaced in 2012 apparently by a Geoesteval, a heavy construction firm with experience in water dams but no experience at all in Tailings Dams or mining, remained associated with the project under a limited scope of services until 2014. In circumstances apparently similar to those leading up to the Mt. Polley failure Dr. De Avila had been advocating more costly risk averse, loss control measures for the tailings facility than fit with Samarco’s emphasis on economics and cost control. We have not seen the text of Dr. De Avila’s public statements and deposition to police but Mr. Caldwell’s statement implies that a buttress for the Fundao was among those recommendations. This was not part of the original Fundao design, which did not include or provide for an expansion of the scale and volume announced by Samarco in 2010. It seems likely that Dr. De Avila had urged design modifications that had been specifically rejected by Samarco. Vale was fully aware of this inadequate tailings capacity through its own independent technical evaluation of the $3.1 billion expansion . Both Vale and Samarco elected to go forward with implementation of the expansion and its dramatically greater throughput fully aware not only that the Fundao could not accommodate this increased waste volume and fully aware that there was not sufficient space on site to create this capacity. Dr. De Avila made further recommendations in the scope of his official continuing capacity in 2014 based on observations indicating stress in the dam. The details of those recommendations and of Samarco’s denial of any knowledge of these reported observations of stress conditions are apparently central to the “Environmental Crimes” investigation now underway. Knight Piesold, original designer of the failed Mt. Polley TSF also being pushed beyond design limits for an unplanned expansion on throughput was let go as it pressed Imperial to address the issue of the dam’s structural stability and its capacity to safely absorb the escalated volume and rate of deposition of tailings. According to his public statements, Dr. De Avila ‘s contractual relationship with the project ended in 2014. Presumably under advice and direction of Geoesteval, in charge of the Tailings Master Plan and the all to do with tailings ( as described in some detail at their web site) a different design modification was made to the Fundao in 2014 than what De Avila had recommended. It is now known that Geoesteval’s master plan to create capacity was to remove the wall between the officially closed Germano joining it with the Fundao to create a single mega TSF. At the time of collapse unauthorized work was underway to prepare for removal of the retaining wall between the old Germano and the stressed Fundao. Other public documents and government public statements have repeatedly mentioned that work to raise the Fundao was also underway at the time of collapse. That raise was presumably within the completed altered configuration changing the original design and not including his recommendations to Samarco for how to modify his orignal dam. It is not clear what peer review or independent technical evaluation was undertaken of the design modifications Samarco elected over Dr. De Avila’s. Jack Caldwell’s comments suggest that peer reviewers and independent consultants agreed with Dr.De Avila and that Samarco simply elected to take a different path. Further information on the specifics of Dr. De Avila’s testimony to police on the Envionmntal Crimes investigation indicates that he was asked by Samarco to create “as built drawings” for submission of required documents for envionmntal permitting and refused ( the dam was not completed at the time he was asked to make the “as built” drawings. It is not clear whether Dr. De Avila has been retained as expert adviser to the police investigation of Environmental Crimes against Samarco and Vale or subpoenaed or just has voluntarily come forward in the public interest. Samarco and its joint venture owners, BHP and Vale have repeatedly pointed to the July 2015,inspection report characterizing it consistently as evidence that the dam was structurally sound. Vog BR conducted that inspection and issued that report. On January 14,2016 after being named in the police investigation of Environmental Crimes, VogBR President Andre Euzebio issued a “Notice of Clarification” at their website speaking to their role in that report and its meaning in the context of law . That statement clarifies that their report was based solely on documents and records provided to them by Samarco, seeming to imply that no actual independent inspection of the dam was undertaken (ie a desk report). This report was prepared with all technical rigor and with all relevant and necessary technical information about the condition of the dam in July 2015. It is important to note that the conditions depicted in July 2015 were not the same as the conditions at the time of failure on November 5, 2015 due to ‘dam operation dynamics’. As further stated in the “Notice of Clarification” VOGBR had been retained by Samarco to design a planned raise of the Fundao 20 meters beyond the original design which the report attributes to Dr. De Avila. They don’t indicate whether that work had involved actual site inspections or independent measurements. The dam project, prepared by the company Pimenta de Avila, predicted internal drainage in the elevation 826m, only the central portion of the structure. Esse projeto não contemplou drenagem interna na região das ombreiras. This project did not include internal drainage in the area of the shoulder pads. The statement concludes wit the assertion that VGBR offered no opinions on and was not involved otherwise in the Fundao’s design or its operation. Dr. De Avila, who has not been named in the Environmental Crimes investigation has reported his dates of service with Samarco as 2008-2012 with a different and lesser consulting role to Samarco 2012-2014. Authoritative statements elsewhere say the Fundao was placed in service in 2009 which is consistent with the google earth photos at Dr Dave Peley’s web site showig the dam in construction prior to 2008. Dr. Avila has not, to our knowledge, provided a public description of his work for Samarco and Vale. VGBR’s statement asserts that Pimenta De Avilar authored the operation manual for the Fundao. Other active legal actions include a $us5.2 billion lawsuit by the Brazilian government against Samarco, BHP and Vale and a class action lawsuit on behalf of U.S. investors. Herculano , also in MInas Gerais have been indicted on 1st degree murder charges for worker death in their 2014 tailings dam failure. Most of the 17 confirmed deaths in the Samarco catastrophic failure were also of workers . Some works have still never been found and are presumed dead. A senior official of the workers union who worked at the Samarco mines has publicly stated that concerns about worker safety had been expressed to Samarco for awhile before accident. No murder charges have been mentioned publicly so far in the Samarco failure. In the coming days, we expect further details on the Environmental Crimes investigation , in particular on the nature of De Avila’s observations on structural stresses observed and reported to Samarco in 2014 . “WOES keep on piling up for cash-strapped Talvivaara, with the police revealing in mid-October that several of the mining company’s employees are suspected of aggravated impairment of the environment. Over the past two years, the economic crimes unit of the Oulu Police Department has scrutinised activities at the Sotkamo-based mine, since its planning and construction phases until the most recent waste water leak in April this year. “While Barrick employees continued to appear before San Juan Judge Pablo Oritja yesterday to give testimony over the incident, the company and the officials who authorized its activities came under more judicial scrutiny yesterday as federal prosecutor Ramiro González agreed to open a criminal investigation following a complaint by environmental lawyers. This second investigation, separate to the probe launched by federal prosecutor Federico Delgado a day earlier, named Environment Secretary Sergio Lorusso, Mining Secretary Jorge Mayoral, San Juan Environment Secretary Domingo Tello, the president of the San Juan Mining Chamber Santiago Bergé and the leadership of Barrick Gold Argentina as persons of interest. “Just this week, MiningWatch Canada and the International Civil Liberties Monitoring Group released a damning report linking Canadian mining interests throughout the Americas with intensifying repression and violence against mining-affected communities. The first images which became available over night in the hours immediately after the November 5 2015 collapse of two of three tailings dams at its Alegria Mine complex in the State of Minas Gerais Brazil.are horrific and apocalyptic. Five-year-old Emanuely Fernandes was swept out of her fathers arms as he tried to outrun the slide, her body found 40 km downstream. Before it was swept away, it was an old well established and very beautiful area . Now it is literally gone. By the 22nd of November the flow reached the Atlantic just north of Rio De Janeiro 600km downstream of the failed Fundao dam coating beaches and the oceans surface with dead fish. Two other very large dams in the complex , the original old Germano and the newer smaller Santorem, were impacted and are being shored up. with rock buttresses to prevent their failure. Initially BHP had reported failures of both the Fundao and a smaller older dam downstream, the Santorem. A Wall Street Journal article November 24 confirms earlier reports that Vale had also been using the Fundao tailings dam but Vale spokespeople claim it was less than 5%.on an annual basis Estadao reports on December 8, however that Vale was responsible for 28% of the total tailings depositions at the Fundao and that its use is illegal. Vale is citing a very old agreement with Samitri, original leaseholder at what is now the Alegria complex, which pre dated the construction and permitting of the Fundao. This 2010 Vale technical report independently reconfirming Samarco’s reported reserves in supporti of Samarco’s $us 3.1 billion expansion project indicates the engineers concern about adequate space within the Alegria complex for the waste that would be created in the planned expansion and step up in annual production . At the time of this report the Fundao dam was already constructed. and beginning to receive tailings. The firm Geoesteval was in charge of the master plan to solve Samarcos space problems for waste management according to their website. This is joint owner BHP Billiton’s second association with a catastrophic tailings dam failure in modern history. (OK Tedi Papua New Guinea) The Tailings dam at their Olympic Dam Mine , acquired by BHP in 2005, has presented serious ground water contamination from improper linings. Neville Rockhouse was the safety manager at the Pike River mine in New Zealand and the father of one of the 29 killed in that disaster 5 years go November 19. In the years since the disaster, Mr Rockhouse has emerged as a campaigner for safety and corporate responsibility. His quote, above to Sydney Herald journalist Peter Ker points in the right direction for ongoing inquiry on this disaster. As a risk manager of long experience with high risk heavy construction and as co author of a recently released major research paper on the risk economics and public liability of tailings dam failures, my own unanswered questions and ongoing focus of inquiry are on the design and construction of the original dams and their modifications to accommodate dramatic production expansions at Samarco’s Alegria Complex. In particular the scant technical information I have been able to assemble and report below points to the possibility of rsgnificant departure from long established and widely shared “best knowledge” and “best practice” on the height, rate of raise and slope of upstream tailings dams. Brazilian prosecutors are also focusing on these issues. in particular whether the rate of raise at the Fundao and its height contributed to failure. We have found no text confirming the history of the three dams referred to and no technical documentation on their original design and construction. Estimates based on scant authoritative data indicate the Fundao pushed and perhaps exceeded the limits of Best Practice/ “Best Knowledge” on height and slope , rate of raise and rate of deposition .. This from 4 data sources: the president of the mine workers statement that the dam was “the size of 10 football fields”, BHP/Vale claims that the Fundao held 50 million cubic meters “of tailings”at failure and google earth photos which show that the Fundao was put in service c 2010, is an un buttressed upstream dam with a very steep face and that there was a very large change in dam height between 2013 and 2015. As further reasoned out below, this puts the estimated height of the dam at failure at 78 meters, and indicates a rate of raise of 15.6 meters per annum and a rate of deposition of tailings of 2 million cubic meters per year. from the time it was placed in service c2009 (is now confirmed by the design engineer that the height of the Fundao at failure was 90meters and the the rate of raise had been 15 meters per year)total tailings deposition has been confirmed at 55 million cubic meters). Although the height and use of upstream construction are consistent with local practice in Peru, Chile and Brazil due to the mountainous terrain and the limited availability of land space, this South American practice violates globally accepted standards for upstream dams. Without these variations from Best practice/ Best Knowledge many South American mines could not be mined at all or continue large scale expansions. The key guidance on ths is in ICOLD (International Committee on Large Dams),WISE(), and Martin Mc Roberts (et.al). Globally resected . This guidance in essence says upstream dams are not suitable for large dams. Globally resected Geophysicist and leader in “responsible Mining” Dr. David M.Chambers has long called for an outright ban on upstream construction. It appears though from Google Earth photos over time that the the Fundao dam , the failed dam, was put on line in 2009 . A series of google earth images show the site as virgin in 2003 and the dam completed and holding tailings in 2011. A 2013 photo in this same series shows a dramatic raise in the dam height . The images 2011 and 2013 clearly show a very very steep face of the dam and that it is unbuttressed. BHP and Vale are claiming the Fundao held 50 millon cubic meters of tailings. This indicates a rate of deposition of 9.2 million cubic meters per annum .and an unsafe destabiliizng rate of raise of 15 meters per year. Head Of Mine Worker’s Union Puts Surface Area of Fundao at “10 Football Fields”. That puts the rate of raise of the dam , including the initial starter dam which would by normal practice be at least 20 m at 15.6 m per year. To reasonably assume zero pore pressure at an upstream dam (within the safe height guidelines of 30m-50 m), the rate of raise should not exceed 4.6 to 9.2 m per year. Under the 10 point safety guidelines for upstream construction originally advanced in 1999 and 2000 and restated in this evaluation of 4 “off the shelf ” dam designs in South America , the prototype of which had failed, authors state that a perfect score of 10 is required for safety of upstream TSF’s.. These rules exist based upon the fundamentals of soil behavior, the experience of numerous tailings dam failures and the experience of well-managed facilities that perform as intended. Of the 10 rules, a “score” of 9/10 will not necessarily have a better outcome than 2/10, as any omission creates immediate candidacy for an upstream tailings dam to join the list of facilities that have failed due to ignoring some or all of the rules”. WISE sets the maximum rate of raise for an upstream dam at 15M/ Yr. for dams also within height and slope limits, which the Fundao was not. Our estimates of average rate of raise at Fundao was 15.6 m per year, just slightly above the WISE guideline but significantly exceeding slope and height attending application of ths guideline. Upstream tailings dam construction is disproportionately the construction type of all tailings dam failures as compared to the safer “centerline” and “downstream” types in global data on unplanned releases 1900-2015 and still a preferred least cost method for land deposition and retention of metal mine tailings especially at low grade mines. They are also universally recognized as the least stable type of construction especially in areas with a high seismic risk. However, best practice has generally been that such dams should not exceed 30m to 50m so they have not, in history or in modern times been associated with catastrophic or very serious failures. A catastrophic failure generally requires an impoundment with a storage capacity of 5 million cubic meters and a height greater than 50m. In 2010 alone Samarco generated 16.1 million cubic meters of tailings waste at this mine complex. Jack Caldwell has confirmed that Samarco specifically rejected adding a buttress to the Fundao against the advice of peer reviewers and consultants. He says that Samarco was fully aware of the magnitude of consequence of failure of the Fundao ,. but relied on its own calculations that the probability of failure was very low against the advice of its consultants and peer reviewers. Dr. David M. Chambers, a geophysicist and highly regarded global leader in responsible mining , repeated his call for an out right ban on upstream dams in the wake of the Samarco catastrophe. Whatever the cause, there’s no doubt the damage from both breaches would have been much less if the tailings had been less fluid, Chambers said. He co-authored a study, still to be peer- reviewed, which predicts the number of catastrophic failures will increase as miners are tempted to build larger upstream ponds in order to cut costs. Brazilian prosecutors are focusing on dam height as evidence of Samarco’s negligence. A piping failure is shaping up as the likely cause and is one of the factors that could cause a fatal failure especially in an upstream dam of this scale. This all points to Samarco as on leading edge of a “culture of innovation” in iron mine production, but “a culture of deviation” with respect to waste management practices. The Santorem received a large part of the release at failure from the Fundau with what exceeded capacity flooding over the spill way into the valley below. This has lead to some confusion on release volume. The Brazilian government and most news accounts are still citing 60 to 62 million cubic meters, the amount BHP/Vale/Samarco cited as the combined tailings content of both dams. WISE, who receive their reports from the miner and not from independent investigation, are citing a 35 million release (that is apparently deducting from total release the amount held by the Santorem) . The WISE account is not clearly annotated or sourced. It wold seen that in accordance with cstmary reporting te full amount of release from the Fundao is what should be recode as release 40 to 50 million cubic meters) and a note or linked report explain that 5 million was held back by the Santorem. The Santorem since 2012 has been under “executive design” by GeoHydroTech a Brazilian engineering company under a broader engineering contract with Samarco that included analysis of failure probabilities and damages in the event of failure. Tailings Disposal System Mirandinha composed of Mirandinha and Santarém Dams. The photo below is from Dave Petley’s landslide blog shows the in tact Germano Dam on the left, which was not authorized to receive any additional tailings after 2009 and the obliterated Fundao the right which was put into service c2009-2010. According to this most competent analysis so far posits a landslide precipitated by the nearly complete release from the Fundao. Dr Petley, an expert on landslides, theorizes that the most upstream dam collapsed causing a landslide which combined highly liquid tailings with the landslide as the mass moved down to Bento Rodriguez. A local officer described the mud flow as 2.5 dmeters high 8 km from the Fundao. A very similar scenario ( although precipitated by very heavy rains) has recently been reconstructed for a previously unreported catstrophic failure of a tailings dam in Mexico in May of 1937. The modeling and forensic study of the tailings flow explains how the forces of the original tailings flow are exponentially increased in total force and flow volume when a landslide is concurrently triggered. The total flow is the combined volume of tailings contents ( tailings+water) and the landslide volume. The term “release” as used in official reporting would not include the landslide volume in the accounting of release but would, if available, be included it in “notes” and included in any study on the forces and total flow creating damage.. So in a precipitated landslide event, as a Samarcos Alegria complex, the magnitude of the flow and its resulting scale of damage can be much greater than the damage that would otherwise be expected from the “release” alone. The Los Cedros Tailings dam was much smaller than either the Fundao or the Santorem, 35 m high with a capacity ( total stored volume) of 14.7 million cubic meters as of the date of failure and precipitated landslide. It’s run out was 11 km casing 300 deaths. The damage estimate was initially put at over $1billion by DeutscheBank Brazilian Officials, after further analysis have launched a law suit against Vale, BHP and Samarco for $us 5.2 billion. Brazil’s biggest newspaper, Folha de Sao Paolo reports that despite this announcement the Federal Government has not been and is not present on the ground either assessing or providing relief. Despite announcing financial assistance for the affected and declaring the incident one of the greatest environmental accidents in the history of the country, the Dilma Rousseff (Workers’ Party or PT) administration has yet to mobilize federal bodies to assist the thousands afflicted by the disaster. During three days in the region, the only sign of federal presence observed by the news team was two Ibama cars along a Mariana road. Runout was initially reported by BHP at 400KM but has pushed to 600 km at the Atlantic . The headlines of Brazil’s largest paper, Fulha De Sao Paolo, are not featuring the catastrophe but continue their reporting on citizen outrage about widespread corruption, calls for reform, and petitions for impeachment of Brazil’s President.. The Wall Sreet Journal reports that safety concerns were raised in an October 2015 inspection on contact between waste rock piles and the Fundao talings dam potentially threatening dam instability, A Brazilian official has publicly cited this same concern and others in a commissioned 2013 report . The recommendations of this report were not adopted or made a condition of renewal of Samarco’s license. BHP says the waste rock pile is still in tact and that the issues red flagged in the 2013 independent assessment have been ruled out as the cause of this failure. This however does not rule out the possibility that pressure from the waste rock pile affected the dam’s stability. .
During its active life the main dam at Germano, was raised by 2.5 meters per month (30 m per year) which again n according T.Martin et al.violates rule 3 of the 10 cardinal rules of safe upstream TSF construction. Dam Rehabilitation & Height Rate of Raise Presented at 2011 VanCouver Tailings Conference. The redesign to allow these extraordinary heights for an upstream tailings dam was presented at a major tailings conference in 2011 as a state of the art best knowledge , best engineering approach to achieving safe heights for upstream constructions even at more than 5 times what is still widely considered the maximum safe height for such dams. The author is closely associated with Info Mine which in turn is closely associated Dr. Andrew MacG Roberson who is acknowledged with thanks in this paper for guidance and advice. Info Mine , created by Dr. Robertson, seeks to present and develop and the best available work in mining and is a long term advocate for responsible, well informed self-regulation by the mining industry. This paper and this dam has been cited in other research as evidence that upstream construction should not be prohibited and can be used safely.even at height well above customary established best knowledge and best practice. It is apparent now that these same departures from known best practice on the upstream dam construction were applied in the design construction and use of the newer Fundao dam which failed on November 5. In 2010 Samarco Mineracao ltd. S.A., the joint venture beween BHP Hilton and Vale through which the mine is owned and operated ,described its new flow sheet to tackle it’s aggressive plan based on the core assumption of the mining metric: that lower grades and falling prices can maintain economic feasibility through larger scale production at lower production costs without any additional increase in environmental security risks or potential public liability. Although the Alegria mine was not on Bowker Assciates watch list of mines presenting the highest risk of economic and associated catastrophic environmental failure , it does meet the Bowker Chambers criteria for a very serious failure and keeps the global trend line to an increasing incidence of very serious failures globally on track with our prediction for 11 very serious failures globally for the decade 2010 to December 31 2019. It also exactly follows the pattern we pointed to as the major cause of such failures: dramatically increased expansions within the existing facilities and footprint of much older mines. driven by falling grades. The decline in grades at Alegria have been dramatic and are presently estimated at between 35% and 45% while still higher than other major itabarite producers. Brazil has been known for its exceptionally high iron ore grades and Vale, Brazil’s largest producer has been known for iron ore grades well above global averages. There are several other cataasophic dam failures in Brazil and its mine centered state of Minas Gerais cited in the Bowker Chambers integrated global data base of mine failures since 1910 . 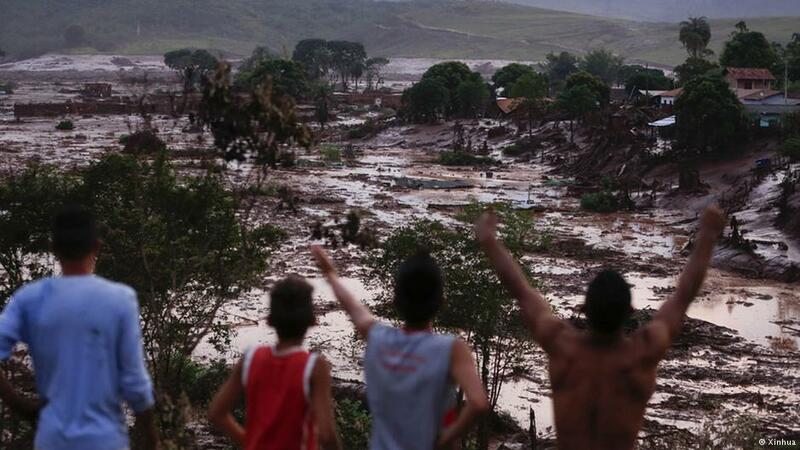 Brazil is disproportionately represented globally in the count of most serious failures tailings dam failures for this decade ending November 5, 2015 with 2 of 9 catastrophic and 2 of 8 major failures including Germano . Samarco Mineração S.A. is a Brazilian company engaged in the mining, beneficiation, pelletizing and export of iron ore. The firm has four pellet plants in Anquieta municipality, in Brazil’s Espírito Santo state, as well as three concentrators in its Germano plant in Minas Gerais state. It also has a port terminal in Ponta Ubu, Espírito Santo, sales offices in Belo Horizonte and Victoria, and two international offices in Amsterdam and Hong Kong. Its yearly production capacity reaches 30.5Mt. The company is owned equally by Vale and BHP Billiton. Samarco Mineração was founded in 1977 and is based in Belo Horizonte in Minas Gerais state. Moody’s revised its ratings on $2.1 b in bonds on Tuesday to what Reuters columinsit Paul Kilby described as essentially a rating of “junk” . BHP shares slid 58c, or 2.5 per cent, to $22.70 yesterday after news of the disaster, which Morgan Stanley estimated could result in a year of lost iron ore production In their first public comments on the disaster BHP has emphasized that all responsibility and liability lies with Samarco. ( This is the legal mechanism insulating parent companies in most of histories catastrophic dam failures from financial liability for damages caused by failure and transferring the lions share of risk and costs to the public) Financial Review Columnist Matthew Sevens has asserted that Vale and BHP nevertheless have a moral obligatin to assume ful lresponsibility for damages. Vale , which has seen a steady and dramatic decrease in its stock price over the past year also took a sharp hit on news of the Germano catastrophic failure settling at $4.14 on the NYSE. Quite apart from the impacts attributable to this failure both BHP and Vale have been in a major performance slide since mid October. While also impacting Rio Tinto and CLF, both have fared better han BHP and Vale. Since mid-October, Vale and BHP Billiton have fallen by 23% and 21%, respectively, while Cliffs Natural Resources (CLF) and Rio Tinto have plunged by 17% and 14%, respectively. A class action lawsuit has been filed on behalf of all investors who lost money because of the failure and the actions leading up to the failure. No amount is named but it focuses mainly on Vale accusing them of fraud and lies. It is important to note that Samarco was not created by BHP and Vale as a joint venture. It was formed with its own corporate vision, its own corporate culture and its own style under the leadership of an economist and has continued in that mode throughout its life. From the outset Samarco’s vision has required strategic alliances with other more established companies to realize is vision. Alegria Catstrophe Consisent With Predictions by Bowker Chambers 2015 research on the economics of tailings dam failures. This brings the total to 6 of the 11 catatsrophic failures predicted by Bowker Chambers 2015 for the decade 2010-2019 .. The total for catastrophic failures for the decade ending November 5 2015 (2005-2015) is 9 very serious failures .as compared to 7 for the decade 2000-2009. We have not yet finalized our data on ore production post 2009 so do not yet have a final failure rate bu based on preliminary estimates the rate of failure as of mid decade 2009-2019 is unchanged from the decade 2000-2009. We will be tracking the further unfolding of details on this most recent catstophic dam failure through daily revisions to this post. One of the three tailings dams in the complex had recently installed an inflatable rubber dam. This report at the designer/installers website indicates that at the time of installation the dam as at 70% capacity. Dr David Petley, a global expert on landslides, has posted that he does not believe the installation or failure of the rubber dam is in the chain of events leading to failure of the two dams and the resulting landslide. Interesting beyond Germano,its failure and issues attending proper design and creation of upstream TSF’s in that p. This was looking at how to handle the fine grained slimes that are a significant part of tailings volume in Brazilian iron mines and which are no amenable to dry stack. Conclusion seems to be..not promising. 11/5/2015 It is exciting and heartening that so much main stream global press has immediately 19sponded to and reported on this failure. That has not been so of the world’s 1990 oher global catstrophic dam failures since 1990. This vital work on the part of the 4th estate is essential to advancing the conversation among the many voices whose expertise is essential to fully mapping the problem of catastrophic failure and evolving a “best moment in time” plan of correction. This dam failure, its history, and its consequence illustrate how limited the global reliance on the post Mt Polley Dam Committee Report is in addressing the global phenomenon of an increased rate and and greater scale of incidents on catastrophic failure. The voices on that Committee are a critical part of the global conversation but each would readily say, I am sure, their commission was not mandated to reform global mining. Samarco reports that two dams collapsed “Samarco officials said on Friday the Santarém dam in the Germano complex had collapsed along with the rupturing of the Fundão dam on Thursday. The firm said it was too early to know the reasons for the disaster or the extent of carnage. The dams are composed principally of sand and inert tailings, a mining waste product of metal filings. The conference presentation on the buttress work refers to the dam as “the main dam” and not by the name “Sanatrem Dam” so not clear whether the same structure. The scale of damage described and photographed however suggests that the Sanatrem Dam is te same dam referred to as “Germano Main Dam”. Dr. Chambers & I learned in our research for Bowker Chambers 2015 that it takes a very long time to get a complete story on any failure and we continually find new information even on much older catastrophic failures. “ESA analysis typically overestimates the factor of safety by a factor of two relative to USA analysis. This in turn would suggest that a great many upstream tailings dams have USA factors of safety of less than one (since they are rarely designed using ESA to a factor of safety of 2 ormore), and should have failed (based on limit equilibrium analysis), but have not. One of the numerous triggers listed that may be most relevant in the case of Samarco given what we know so far is the rate of raise and/or construction activity at the crest. Critically important in evaluating the Samarco falure is that traditional guidance on assumed zero pore pressure at rate sof rise of between 15ft t 30 ft per year applies when the height is 35m or less. given time, which in turn require a good understanding of the pore pressure conditions (hydrostatic versus downward drainage, normally consolidated versus excess pore pressures) within the dam. The prototype failed leading to an evaluation of the three other identcal dams at the owners other mines in South America. and drainage zones to ensure the starter dam would function as a toe drain. above the starter dam crest elevation. list of facilities that have failed due to ignoring some or all of the rules”. The rate of rise at Germano main dam was 2.5 meters per month according to the 2011 Tailings Conference presentation on its reconfiguration. could develop due to formation of chemical precipitates generated by oxidation reactions. While not a complete strategy for preventing catastrophic dam failures, the West Australia Mine Regulations are state of the art globally. Here are therir guidelines for tailings dams. ( Included this because of reference in one article post collapse that the failure occurred or was just after installation “of a a rubber cap at the dam” As a Risk manger, from a Risk Manger’s poin tof view the use of untried, unproven technology in high risk situations is only o.k. where the risk is already present and there is no known proven solution. In mining there is a continual push to allow unproven systems even in ultra high risk situations where a failure would create that risk.. This application proposes use of geosynthetic membranes in lieu of engineered soil and rock layers that would normatively be used. This is a case study of centerline dam, China’s largest with an 800 million cubic meter capacity and a design height of 20 meters. It finds that while the design under normal working conditions , it cannot attain the specified coefficient of sfatey under conditions of saturation. Centerline construction is safer than upstream configuration for any holding of tailings.Downstream construction is recommended for very large dams but space constraints, costs, and local availability of materials centerline construction is most often used for modern large dams. At Mt Polley, deviation from the Knight Piesold design due to non availability of suitable materials resulted in what was essentially an upstream design also violating upstream construction standards..Mt Poley was, though within accepted height guidelines for an upstream dam at approximately 60 meters. The dam committee investigating cause of failure found that a buttress recommended by the Ministry of Mines would have prevented the failure if Imperial had acted in time. This entry was posted in alegria mine, Analysis TSF Failures, BHP, Bowker Associates Science & Research In The Public Interest, Brazil 's High Grade Iron Ores, Causes Of Catastrophic Tailings Dam Failures, Center For Science in Citizen Participation, David M. Chambers, Dirk Van Zyl, Frequency of TSF Failures BY Decade, Geoesteval, Germano Tailings Dam Failure, Height Limits of Earthen Dams, Lindsay Newland Bowker, mine Company Valutaion, Mine Feasibility, Mine Risk Management, Mining Economics, Mining Environmental Crimes, mining environmental risk management, mining public liability, Pimenta De Avilar, Rate of Raise for Upstream Tailings Dams, Risk & Public Liability of Tailings Dams, Risk Economics and Public Liability of Tailings Dam Failures, Samarco Environmental Crimes Investigation, Samarco Mineracao S.A., Samarco Tailings Master Plan, Samitri, Tailings Dam Risk Management, Upstream Tailings Dam Safety, Vale SA.. Bookmark the permalink. There is a mismatch between the company description in the literature and the events that have unfolded. A 2013 paper at a paste conference stated that stacked tailings was employed at the Samarco mine. Yet the description of the accident in all the media reports does not suggest this. Morven, appreciate your stopping by and osharing your thoughts. I believe you are refrring to Dr. Dr. Avilar’s paper at a 2011 paste conference? Tha tis referenced in my post. The buttress and . removal and ry stacking of Tailings was a the mega large Germano as part f its closing. The Germano was not authoroized to receive e any additional tailings after its closing. The new much smaller Fundao is right next to the Germano and there was a retaining dike all along that common boundary. The Fundao was upstream construction no buttress. The Fundao went active sometime in 2009.. At the time of your post ( sorry I am just seeing it)we were all confused as to which dam failed and had no names for any of them. . Yes I follow Dave Tepley. His blog is excellent his analysis well informed and authoritative.